Low noise and smooth workout with magnetic resistance system featuring 1.5kg flywheel and a total weight of 14 kg providing stability. Integrated handle for easy transport. Stay on the move with Sit-Fit! 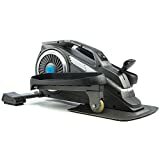 Ideal for home and office use, the Sit-Fit is an elliptical trainer that promotes active sitting, strengthens the foot and leg muscles, promotes circulation and burns calories. All of this is possible as you sit at work or at home on the sofa. The Sit-Fit is a high quality machine weighing 14 kgs that delivers a smooth, quiet and stabile training experience. The large pedals with grip ensure a smooth action so you can concentrate on your work, study or reading, and hardly know the Sit-Fit is there. The integrated handle aids in transportation. As we are all now aware, sitting for prolonged periods without exercise is unhealthy. Nevertheless for many of us it is an unavoidable part of our working life. With Sit-Fit, you can turn this physically unproductive time into a healthy workout that keeps your metabolism active & your circulation moving. With 8 manually adjustable intensity levels, you can easily adjust Sit-Fit to your individual needs. Thanks to the digital display, keep track of the time, number of repetitions and calories burned, to give you an overview of your performance and keep you motivated. Sitting doesn’t have to be inactive, stay on the move with Sit-Fit!